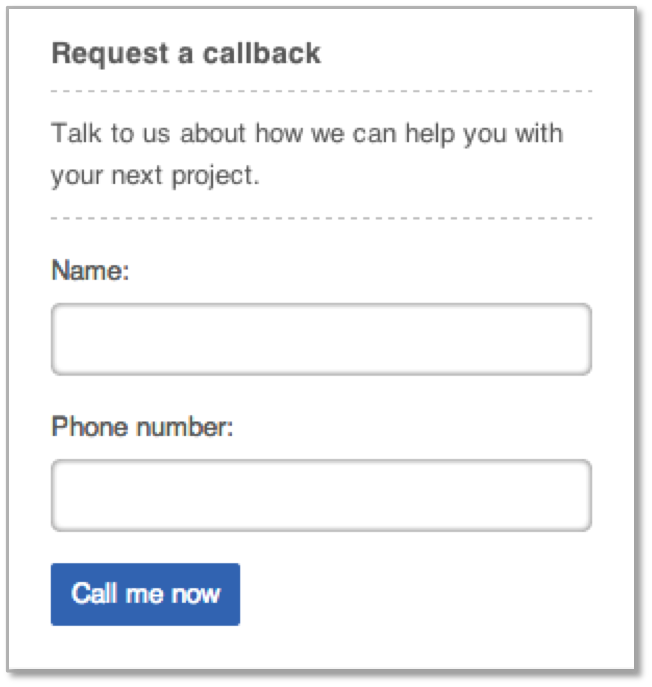 We’re big believers in not reinventing the wheel, so after a period of research we decided to use Twilio to provide callback functionality. Twilio gave us the functionality we needed without a vast amount of coding. When a potential client fills in the simple callback form, a text is sent to a member of our team with the person’s name and phone number, enabling us to call them back. 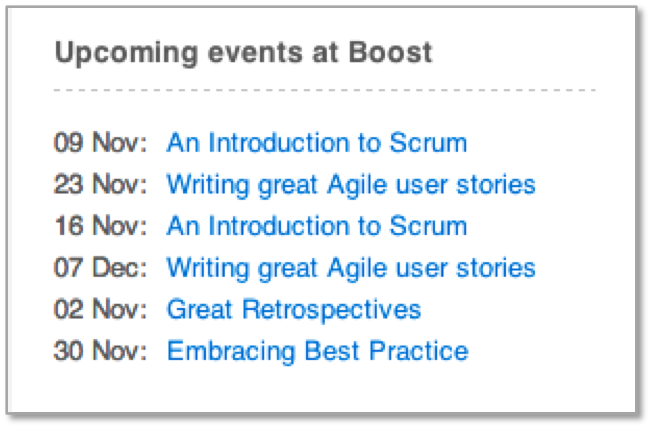 We run a number of Agile events here at our Wellington office and we currently use Eventbrite to manage booking. Our upcoming events feature links to our Eventbrite page, however we found that Podio, which we use to manage attendees, had a less complex API to pull in information on upcoming event dates. We now have a story in our backlog to create a new page that will allow attendees to book via our website. We’ll move over to managing our events solely in Podio as the API allows us far more flexibility to integrate signups with the administration of attendees. 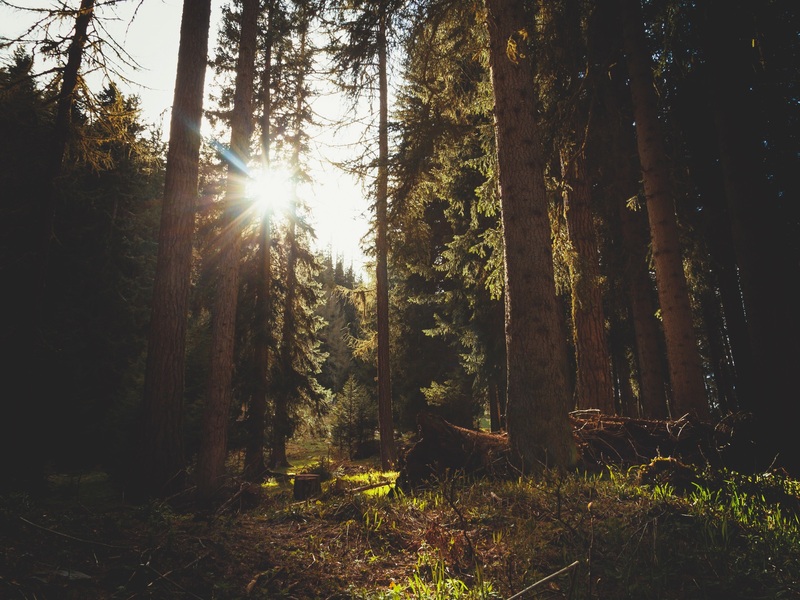 We had previously organised our services section with quite generic headings and had featured client names as headings, we’ve now tweaked the content and layout so that the headings are more specific and the projects we’ve featured support the types of services we offer. For example, previously we’d named the top section ‘Web’ and featured projects by client with distinct boxes around each featured client/project underneath the heading. 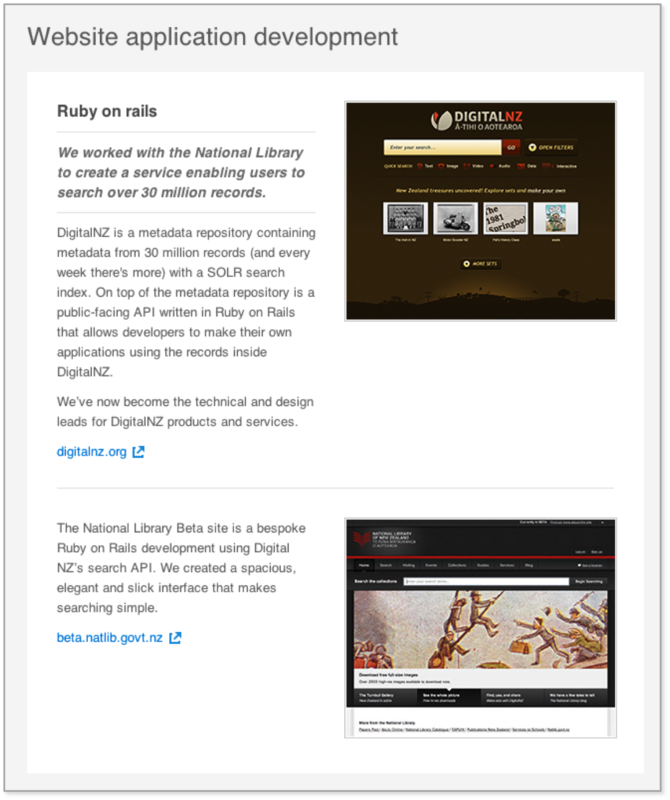 We’ve now revised the title to read ‘Website application development’, which more accurately describes what we do. We then redesigned the content underneath so that we feature types of web application development as sub headings and then detail specific projects demonstrating our capabilities in that area. We think this gives a clearer idea of where our expertise lies. Keep watching this space and our homepage for further developments.